Mystery positive notes in the girls school bathroom? Today I’m looking into a mystery that’s been going on this past week at Highland Park Senior High. 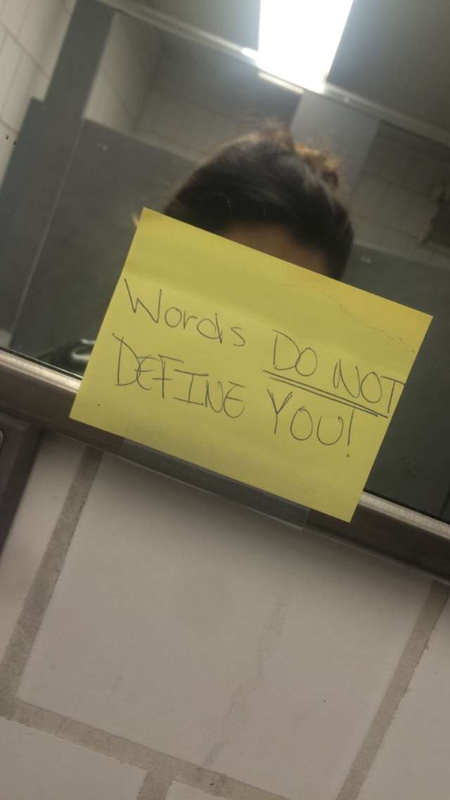 April 12th, 2016 some mysterious student(s) decide to put sticky notes, with positive messages written on them, up in the girls bathroom. But, they decide, the next day, to take them off. This left people with questions about who this person, or people, is/are and why are they doing this. Being one of the individuals that was left with questions, I decide to take it into my own hands and try to find out more about this mystery. It turns out, random students (girls) are the ones putting up the sticky notes. During the school year, they decide to wrote positive Post-it notes to make other girls feel better when they were feeling down. They put them around the school bathrooms to remind them they were not alone. Usually, the people who do this sort of thing don’t take credit for it. It’s like they want it to be a mystery, and students have been doing this for a while now, according to some older students at Highland Park. I decide to ask a student about what they tought about this. Her name is Olivia Verdeja, a freshman at HPSH. My opinion is that people at Highland should start to do this more often, as just one little thing can make a difference in others’ lives; both those who are struggling, and those who aren’t. Also, kids need to know that everyone cares and they’re not the only ones who feel like they do. Working together as a whole school coming together is a great thing. « Do teens really know about the politics of today?